If you’re a fan of FOX’s New Girl, like me, then you’ll probably know who Jake Johnson and Damon Wayans, Jr. are. If you aren’t a fan, then let me give you a hint – they are two very funny dudes. 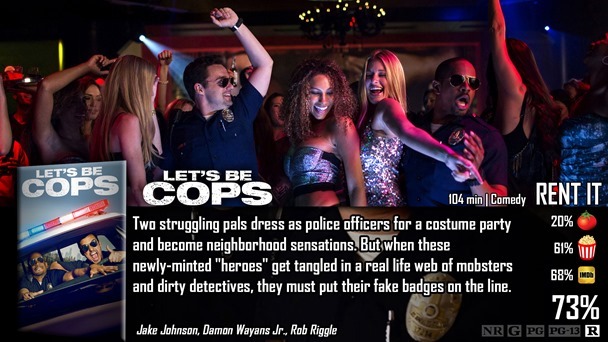 When I first saw the trailer to Let’s Be Cops, I thought it was a New Girl movie, given these two are the main characters and typically sport the same exact personalities that they have on the FOX sitcom – it could be easily misunderstood that these are basically the same characters. At any rate, it looked like a decent enough comedy to check out, and for the most part, it is just that. If you have seen the trailer to the movie, you know exactly what it’s about, and probably can guess how it’ll play out from beginning to end. It’s about two friends that basically have no life and act like children…and when that starts to look bad, they decide to be…cops. They dress up in actual police attire and parade around town doing cop things. One of them, O’Malley, really likes the job, and starts obsessing over the things that they are doing, oblivious to the fact that it could send them to prison for several years. Obviously – they are bound to run into the biggest crime boss in the city. I’ll tell you what I liked about the film, and then I’ll tell you what I didn’t. I did like how this film began. We have two very likeable characters with tremendous chemistry and a sense of humor. They are quite simply – hilarious to just…watch. When they start doing their police thing, it’s like…when we were kids playing cops and robbers all over again. Their childlike personality shines through and they do everything that they can to make an audience laugh – simply by taking their authoritative role as police officer – and do a bunch of silly things. It’s hard to say really, but it is funny. It’s stupid, but it’s funny. However, you can probably guess that it can’t last forever – and it doesn’t. The movie has no other choice but to resort to a predictable plot. It’s not their fault really, because you can’t have a film like this without it ending a certain way – and that way really isn’t that hard to predict. So once it starts heading that direction – primarily when we meet the main bad guy, the film hits a bit of a low. It gets boring because the two guys playing around – changes gears. They aren’t just blindly having fun and abusing their power anymore, because now they are simply taking things too far. I get it, but it just wasn’t as fun, nor funny when you really think about it. I suddenly knew exactly where it was going, and I kind of lost interest halfway through. I’ve seen a few comedies this year, and Let’s Be Cops is honestly one of the more decent flicks. It’s not perfect, and the comedy dithers out as it goes along, but it’s far from a film that you would try to escape a viewing from. It’s just…decent enough. In short – the first half. We meet a couple of very likeable guys with a great sense of humor – and we see them get into their roles as policemen, and the things they do just for the heck of it is surprisingly hilarious. Another case of most of the funniest moments being in the trailer. Red band trailer, anyway. Even then, there weren’t as many laugh out loud moments as I think there should have been. I mean, these guys? It could have easily been better. 69% for me.